Pumpkin spice may have a bad reputation, but pumpkin is actually a nutritious treat. Here's how to enjoy it healthfully. My first — and only — experience with the infamous PSL (pumpkin spice latte) was memorable, largely because I ended up in the emergency room a few hours later. This had nothing to do with the beverage, but I still associate it with ambulances and CAT scans. As for the PSL itself, my taste buds deemed it artificial and overly sweet, but I’m a minimalist when it comes to coffee. Due to customer demand, the PSL shed its caramel color and artificial flavors in 2015 in favor of actual pumpkin and natural plant-based coloring. Unfortunately, what didn’t change is the sugar — a grande contains 50 grams, which is more than 12 teaspoons. This year is the 15th anniversary of the PSL, and the pumpkin-spice obsession continues to grow, albeit with signs of cooling — much like the Seattle housing market. Today, you can find pumpkin-spice versions of everything from breakfast cereal, English muffins and peanut butter to liquor, beer and wine — plus (seemingly) half the products at Trader Joe’s. Many of the food products riding the pumpkin-spice wave are far from nutritious — think cinnamon rolls, candy bars, cookies and soda spiked with artificial pumpkin-spice flavors — but some are truly nutritious foods that use real pumpkin and real spice. My favorites of the lot are Siggi’s Pumpkin & Spice yogurt and the Pumpkin Spice Rx Bar, which adds pumpkin, cinnamon and cloves to its usual real-food mashup of egg whites, dates and nuts. 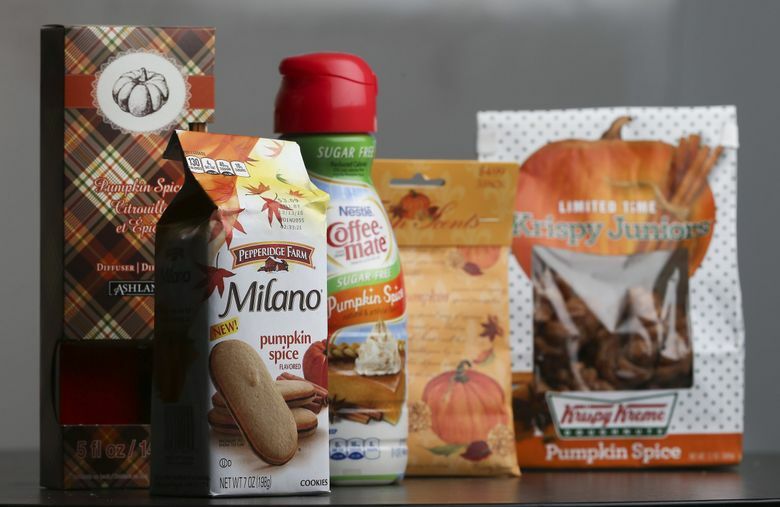 There’s an ongoing debate about whether “pumpkin spice” refers to just the spices, or the spices plus the pumpkin. Either works, in my book, and if you love those flavors of fall, it’s easy and nutritious to DIY it. Simply mix a batch of pumpkin-spice blend and keep it on hand to stir, with or without puréed pumpkin, into cooked oatmeal, overnight oats, or Greek yogurt. You can also blend it into your morning smoothie. Or go old-school and bake pumpkin pie and pumpkin-spice bread for holiday treats. Pumpkin itself, along with other winter squash, is a wonderfully healthful source of fiber and nutrients. One cup of cooked, mashed pumpkin contains only 49 calories and also 3 grams of fiber. To lighten your traditional sweet-potato casserole, roast pumpkin wedges with sweet potatoes, then mash their flesh together to incorporate into your recipe. That cup of pumpkin also provides more than twice your daily vitamin A needs in the form of beta-carotene and other carotenoids. Beta-carotene may help protect against cancer, fight inflammation and improve skin appearance. Even better, many of the starchy carbohydrates in pumpkin and winter squash have unique antioxidant and anti-inflammatory properties. Canned puréed pumpkin is similar to what you would get if you roasted or boiled hunks of raw pumpkin yourself. When shopping, be sure to not accidentally grab canned pumpkin-pie filling, which can have nearly 300 calories per cup, plus a lot of sugar. If you like a sharper edge to your pumpkin spice, increase the ginger and cloves. If you like yours on the softer side, increase the cinnamon and/or decrease the ginger and cloves. Add all spices to a small bowl and stir to combine. Transfer to a lidded jar or other airtight container. Enjoy!